TACNY Maker Hall At Dr. King Community Day, 30 January 2016 – CNYO Members Welcome To Join In! CNYO will once again be running an astronomy and space science booth at this year’s TACNY Maker Hall on January 30th. I welcome anyone who wants to sign up through the yingtrsef.org links below and hang out to talk astronomy, demonstrate telescopes, keep track of my Mars and Ceres (and other) rocks, etc. If you’ve interest in attending, please drop me a line at and then fill out the registration info (below). We’ll plan the number and busy-ness of the booth pending interest. Details below from the official TACNY email announcement. The 2016 TACNY Maker Hall joins the Dr. King Community Day on January 30th! We are looking for individuals and organizations to volunteer their talents to run Adventure Stations. For two years, this well-known Science, Technology, Engineering & Math (STEM) outreach program has gathered over 300 Makers of all ages. The more volunteers, the more varied and engaging the event becomes! Everyone is invited to the Dr. King Unsung Heroes ceremony and the meal to follow! Why? Because STEM is FUN! Adventure Hosts can use existing “station kits” or you can come up with your own Adventure ideas that can me later used for year-round exploration by CNY schools, libraries and youth organizations. Maker experiences create inexpensive and fun windows into a variety of STEM fields. 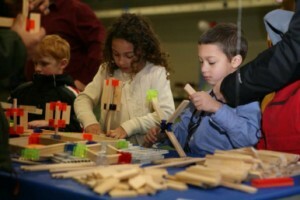 Children, teens and adults discover the importance of STEM as they play! If you or your organization is interested in supporting this highly deserving STEM outreach program, please reply or email with your list of volunteers and your Adventure Station idea no later than January 8th, 2016. Space is available on a first come, first served basis. Can’t make it? Donations are welcome (TACNY is a 501(c)(3) organization) so we can expand access to Maker experiences and the fascinating world of STEM!